Summary Marvell-based dual-band, dual-radio N router with Gigabit ports, USB drive and printer sharing and three-stream N (450 Mbps) support on 5 GHz band only. D-Link and NETGEAR publicly revealed their "cloud router" plans during January's CES. Since then, D-Link has shipped its first cloud router, the DIR-605L, which, frankly isn't that impressive. And NETGEAR is still working on its "Smart Network", with no time frame for actual product. 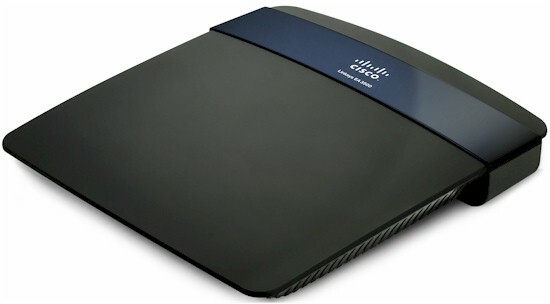 With the announcement of its "App Enabled" routers and Cisco Connect Cloud, Cisco looks like it might have a chance to take a commanding lead in the next stage in the evolution of the home router, if they deliver the pieces that they are right now just selling futures on. The devil is always in the details, however, so let's dig in. I'm choosing to review the EA3500 first, even though it is the middle member of the new EA lineup shown below. I passed on the EA4500, since it is just a rebadged E4200 v2, which has already been tested and reviewed. I won't be retesting the EA4500, but will write up a short piece on it later, basically pointing to the E4200 v2 review. And yes, I'll be testing the EA2700, since it also sports a new Broadcom-based hardware design. Sharp eyes may spy a new low-end member of the non-cloud Linksys line, the E900. The E900 ($49 MSRP) has essentially the same Broadcom-based design as the E1200 ($59 MSRP), on a smaller cost-reduced board. To justify that cheaper price, the E900 lacks Guest Access and Parental control features and doesn't support Cisco Connect or Cisco Connect Express mobile apps. The EA3500's rear panel has the same ports, lights and switches as the E4200 v2, but with a different layout dictated by its new board. The reset switch is accessible via a hole on the bottom panel, which has no wall/ceiling mount screw slots. Word of the EA actually was out a few weeks ago, when Walmart jumped the gun and put EA3500 and EA4500's on the shelf. Other posts have reported on the EA3500's Marvell-based design, which is very similar to the E4200 v2's as Table 1 summarizes. I've highlighted the key differences in bold red. One of my industry contacts helped me identify this mystery Marvell processor as a member of the ARMADA 300 family. The base part number is 88F6W01. Other members of this family include the 88F6282 and 88F6283. The key difference for the F6W01 is that it lacks the two SATA 2.0 ports that the other parts have. Like the original E4200, the EA3500 is an "N750" router, supporting dual-stream N (300 Mbps maximum link rate) on the 2.4 GHz band and three-stream N (450 Mbps maximum link rate) in 5 GHz. Design-wise, you can think of the EA3500 as an E4200 v2 with half the RAM and flash, less powerful CPU and one less power amplifier for the 2.4 GHz radio, packed into a more compact box. The same two-device Marvell chipset (88W8063 Dual-band 3x3 MAC/BB and 88W8366 Dual-band 3x3 MIMO transceiver) is used for both radios, with the difference being the SiGe power amplifiers, which are different for each band. As with the original E4200, the 2.4 GHz radio has three antennas, with the third antenna used only to enhance receive gain. You can see the layout differences between the two products in the photos above and below. The FCC internal photos, which Cisco released without its customary delay, didn't have a good internal view of the EA3500 with the RF shields removed. So I pasted up the composite view below from the detail photos in the FCC document. You can see a thermal transfer pad on the processor in the EA3500 photo below. When I opened up my EA3500 review sample after testing to identify the RAM and CPU, I found the RAM and switch also thermally coupled to the shield cover. Same goes for the 88W8366 BB/MAC under each of the radio shields. Here's a similar no-shield view of the E4200 v2 board.